In the Athens press conference launching the "Human Rights Torch Relay" on August 9th 2007, Dr. Charles Graves, Secretary General of Interfaith International Centre, delivered a speech in which he said that Falun Gong promotes traditional values and facilitates Western society's understanding of Chinese culture. He proclaimed that people in Western society have come to understand Falun Gong through observations and the Chinese regime's attempt to defame Falun Gong have failed. 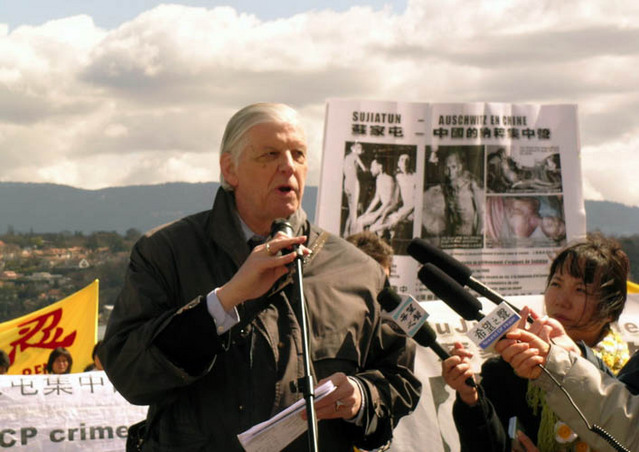 Dr. Graves said the Chinese regime has defamed Falun Gong for many years, including slandering Falun Gong practitioners over alleged suicides, and accusing Falun Gong practitioners of endangering social stability. Through their own observations, however, people in the West have gradually come to understand Falun Gong, and they have not found any improper activities associated with Falun Gong. On the contrary, Falun Gong promotes tolerance and compassion, which are the common values of Western societies. Furthermore, Falun Gong upholds the traditional values of Chinese culture and deepens the West's understanding of Chinese culture. He pointed out that the Chinese communist regime's attempt to defame Falun Gong had completely failed. He further introduced CIPFG (Coalition to Investigate the Persecution of Falun Gong in China), a non-governmental organization comprised of major political leaders, lawyers and researchers from many countries. The group calls for an immediate end to the Chinese regime's persecution of Falun Gong, the release of all incarcerated Falun Gong practitioners, and it urges the Chinese regime to permit a United Nations' investigation of the persecution that Falun Gong practitioners have suffered in the labour camps and prisons of China, including organ harvesting from live practitioners. The mission of the Interfaith International Centre, a non-governmental organization headquartered in Geneva, Switzerland, is to promote inter-religious understanding and co-operation and protect the human rights of various faith communities. The organization has made several propositions in the meetings of United Nations' Human Rights Commission to support Falun Gong practitioners and expose the facts of the Chinese regime's brutal persecution of Falun Gong. "Hurry up! I Want to Learn Falun Gong"
A Friend on the Internet States, "That's Enough! Stop the Cruel Persecution!"